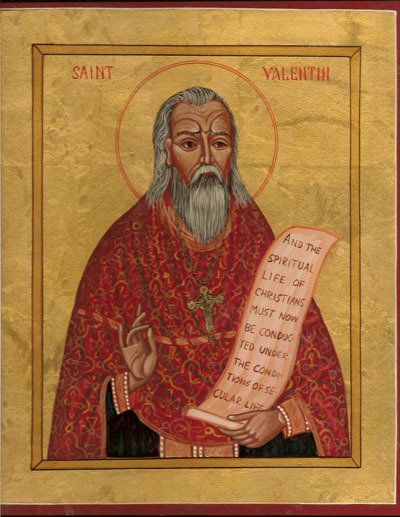 A couple of months ago, I did a post about St. Valentine and how he has nothing to do with modern, secular celebrations of Valentine’s Day. I mentioned how hard it was to find good info online because so many sources mix-up folklore and urban legend with actual history. And it just got a little harder. I was beaten with clubs, beheaded, buried under the cover of darkness, disinterred by my followers, and you commemorate my martyrdom by sending each other chocolates. I so wish I had written it. I hate Hallmark holidays. So why am I not showing the original meme? Because the owners of the original, physical image asked me not to, as they feel it is a disrespectful use of a religious icon. Why is it getting it’s own post? The image isn’t even the St. Valentine associated with Valentine’s Day. I try very hard here to get my references and images correct, even though I depend a lot on the Internet. But in this case I wasn’t fetching an image as an illustration. I was just posting a meme. 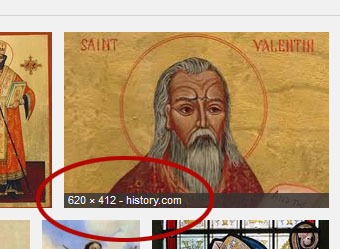 But that doesn’t change the fact that the above image is not the Roman martyr St. Valentine. It’s St. Valentine Sventitsky, a 20th century New Martyr who died under the Soviet regime. He refused to recognize the Church as being in unity with Soviet ideologies and loyalties…a rather problematic claim considering the Soviet Union was officially atheistic. In totalitarian communism, each person’s loyalty was to be dedicated exclusively to the state, unfettered by any other ideology, including religion. I hold nothing against the meme maker. If you Google “St. Valentine,” the image shows up several times, always on pages about Valentine’s Day. However, there is someone who knows better. First row, far right. I am baffled as to how this would happen short of the History Channel having no professional standards, which has been my growing opinion of them for years. This image was made in the 20th century specifically for the Sacred Hermitage of St. John the Divine, so presumably it’s still under copyright. That means History.com should have gotten permission from the artist to reproduce it, and the artist presumably would have only agreed if it was going to be used about Valentine Sventitsky. Now, without knowing the back story, maybe this somehow goes under fair use (which is a murky issue on the Internet) or something else that would make this legal. I’m not here to argue legality. However, I fail to comprehend how a reputable source could have informed them it was the Roman martyr. It feels suspiciously like they just pulled it off the Internet with far less fact-checking that I do, and I’m not being paid for it. In all, there are about a dozen St. Valentines, plus a pope. 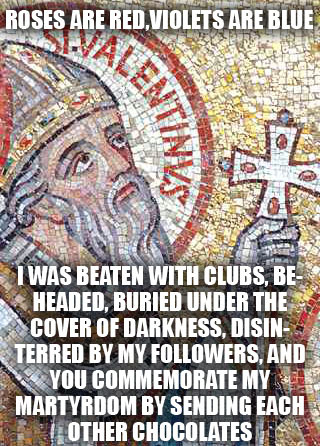 The saint we celebrate on Valentine’s Day is known officially as St. Valentine of Rome in order to differentiate him from the dozen or so other Valentines on the list…The official Roman Catholic roster of saints shows about a dozen who were named Valentine or some variation thereof. To make this easier, I’m going to presume those facts are correct. My objection is the article ignores a significant segment of Christianity: the Orthodox Church. There are many saints recognized by both Catholic and Orthodox Churches, but there’s also many who are recognized by only one, and Valentine Sventitsky is one of them. Yet the article only addresses the Catholic roster of saints. The writer couldn’t be bothered to look up Orthodox ones. Farther down the article it does mention the Orthodox feast days for St. Valentine (although it seems to think it’s two feasts for the same guy, not two feasts for different guys), but, seriously, you can Google that. Heck, I think it’s in Wikipedia. I’d never get off the Internet if I did that. In the meantime, you can read about more objections to the History Channel in Aliens, the Apocalypse, and Truckers. History	bad history, christianity, history channel, popular culture, saints, What is wrong with you?